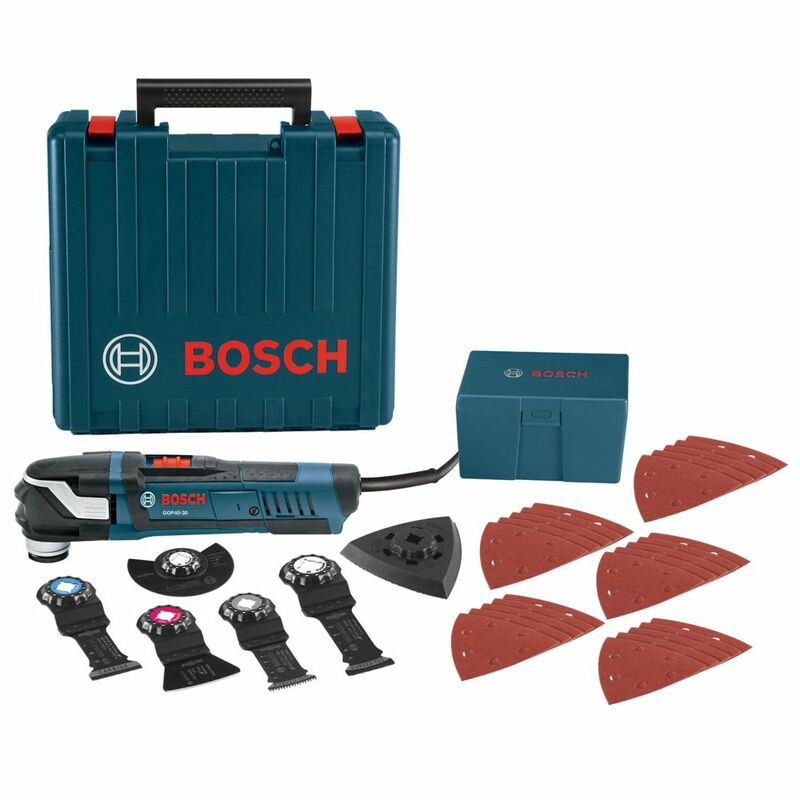 The Bosch GOP40-30C StarlockPlus Oscillating Multi-Tool Kit includes a tool that has the Starlock next-generation 3-D tool-accessory interface, which produces best-in-class accessory grip, making it the new professional standard in oscillating tool performance. With more contact surface area between the tool and accessory, the Starlock interface is a cupped 3-D tool-accessory connection that delivers greater torque transfer for an expanded work capacity. The no-touch blade-change system makes it easy to attach, remove or reposition blades. The professional-grade 4.0 Amp motor delivers a top speed of up to 20,000 oscillations per minute, and the tool provides a 3.0 Amp oscillating arc. The Bosch line of cordless tools uses the industry's most advanced lithium-ion technology for greater battery life and more run time, all in a lighter package. The lightweight design of the PS130 is ideal for easy handling in overhead operations and tight spaces, and the Bosch 12 Volt Max hammer drill/driver lets you tackle professional jobs with ease. The Bosch PS41 12 Volt Max impact driver offers the precision of variable speed, a light body, and a short head length. The Bosch line of cordless tools uses the industry's most advanced Lithium-Ion technology. This gives the battery greater battery life and more run time, all in a lighter package. The lightweight design of the PS31-2A is ideal for easy handling in overhead operations and tight spaces. The Bosch 12 Volt Max drill/driver lets you tackle professional jobs with ease. The Bosch PS41 12 Volt Max impact driver offers the precision of variable speed, a light body, and a short head length. The Bosch GSA18V-125K14 18V EC Brushless 1.25 inch-Stroke Multi-Grip Reciprocating Saw Kit with CORE18V Battery features the first cordless recip saw with orbital and non-orbital sawing action for superior cutting in materials from wood to metal. The GSA18V-125 recip saw has an innovative and balanced angled-motor design, an efficient EC Brushless 18V motor and corded-like power. Its three orbital settings (0-1-2) allow optimized cutting in all types of materials. The saw delivers 0-2,500 strokes per minute at a labor-saving 1.25 inch per stroke. For comfort, it has integrated Vibration Control counterbalance technology to limit vibration, a long, easily reachable variable-speed trigger switch and a toolless blade-change system. The CORE18V battery features next-gen Li-ion technology that produces 80% more power than previous cells. The battery's CoolPack 2.0 technology provides up to 135% more cooling effect than batteries without CoolPack. 4 Amp Corded StarlockPlus Oscillating Multi-Tool Kit with Case (32-Piece) The Bosch GOP40-30C StarlockPlus Oscillating Multi-Tool Kit includes a tool that has the Starlock next-generation 3-D tool-accessory interface, which produces best-in-class accessory grip, making it the new professional standard in oscillating tool performance. With more contact surface area between the tool and accessory, the Starlock interface is a cupped 3-D tool-accessory connection that delivers greater torque transfer for an expanded work capacity. The no-touch blade-change system makes it easy to attach, remove or reposition blades. The professional-grade 4.0 Amp motor delivers a top speed of up to 20,000 oscillations per minute, and the tool provides a 3.0 Amp oscillating arc. 4 Amp Corded StarlockPlus Oscillating Multi-Tool Kit with Case (32-Piece) is rated 4.8 out of 5 by 28. Rated 5 out of 5 by Howard from Best tool on the market.... Best tool on the market. Rated 5 out of 5 by Kyle from Great tool, we’ll worth the few extra dollars!... Great tool, we’ll worth the few extra dollars! Rated 5 out of 5 by huzzbus from Great Tool Have rarely been so incredibly satisfied with a power tool in all my life. Rated 5 out of 5 by Larry from Works great and has plenty of power. I have only... Works great and has plenty of power. I have only used it for cutting a 1" x 6" between the studs. Rated 5 out of 5 by David from This is the best of the best of the oscillating... This is the best of the best of the oscillating tools. Do not purchase other brands. They do not compare. Bosch tools are top quality and far exceeded the competition. I think that’s why you don’t find them at most box hardware stores. The other brands just can’t keep up. Yes, they do cost a little more. The additional quality is well worth it. Rated 5 out of 5 by Jerame from I have only cut drywall with it so far. It... I have only cut drywall with it so far. It is far quieter than the Craftsman I had. The blades snap right in and drop off with the lever. Looking forward to not burning myself on hot blades anymore. It cut smooth and accurate with a narrow cut line. I like it.